The Syrian Democratic Forces, an alliance of Kurdish and Arab fighters, launched an assault this week to take the northern city. The SDF has been closing in for months with the help of air strikes and special forces from the US-led coalition. Smoke rises from the al-Mishlab district at Raqqa's south eastern outskirts. 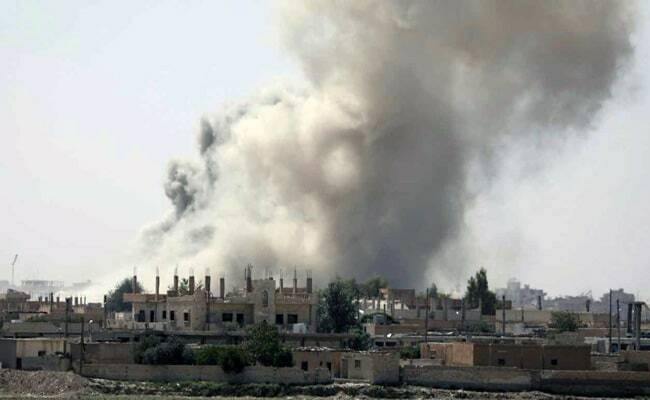 Beirut, Lebanon: Syrian government warplanes struck ISIS positions west of Raqqa city on the southern bank of the Euphrates river on Thursday, state media said. "The air force destroyed positions and armored vehicles" in the western Raqqa countryside, about 70 km (44 miles) from the city, state-run news agency SANA said. US-backed militias have separately been pushing into the edges of Raqqa city in the first days of their attack to seize ISIS's base of operations in Syria. ISIS terrorists have made enemies of all sides in the six-year Syrian conflict, losing territory to several separate military campaigns over the past year. The Syrian army has made gains against ISIS in the east of Aleppo province, bringing them to the provincial border with Raqqa which is largely under SDF control. The Russian-backed Syrian army and allied militias then crossed into Raqqa province this week from neighbouring Aleppo. The strikes on Thursday targeted areas near the provincial border, along a highway linking Raqqa to Aleppo and close to the Tabqa area the SDF captured from ISIS in May. The Syrian government described the Kurdish-led war against ISIS as "legitimate" last month. Damascus also said its military priorities were ISIS-held Deir al-Zor and the Badia region at the border with Jordan and Iraq, suggesting it does not intend to challenge the Raqqa campaign underway.